Colby's selection of conveyor systems includes roller conveyors, belt conveyors and gravity roller conveyors. Contact us today for more information. Transform your product handling issues into financial savings, and even profits with our comprehensive selection of conveyor systems. Regardless of the type of business you’re running, transporting products throughout your warehouse is a necessary evil. Like most workplace activities, the transportation of goods around your warehouse will increase your overall expenses, and will drive the price of your products up, even if you’re only moving them small distances. Thanks to the advent of stricter OH&S requirements and rising labour costs, manual handling has become an expensive process. However, by investing in a conveyor, whether it’s a Belt Conveyor, Roller Conveyor, or Gravity Roller Conveyor, will result in significant savings in regards to both finances and labour. Transportation conveyors can flow throughout your facility, eliminating rehandling before and after each process, and can even be loaded and unloaded automatically; reducing the amount of manual handling needed, and importantly the cost of handling each carton. Colby’s extensive and flexible range of conveyors includes Gravity and Powered Conveyors for simple movement of cartons; Incline/Decline Conveyors for moving product between levels; Accumulation Conveyors for buffering between processes; and Pallet Conveyors for handling bulk stock and heavy items. Whether you only need a short length of conveyor to carry products over small distances, or you are looking at automating more of your processes, Colby’s conveyors offer three important advantages: more flow, more manoeuvrability and more management control. All of which will save you and your customers’ time and money. Colby’s conveyor solutions are all designed and engineered in Australia. Our team of professionals are qualified to select the right conveyor solution for your business. Contact us today. Our range of carton conveyors include gravity wheel and roller conveyors, powered line shaft, belt conveyor, and smart accumulation conveyors, all available in a range of widths. Colby Carton Conveyors join processes together, deliver and take away products, and even intelligently sort or merge goods. 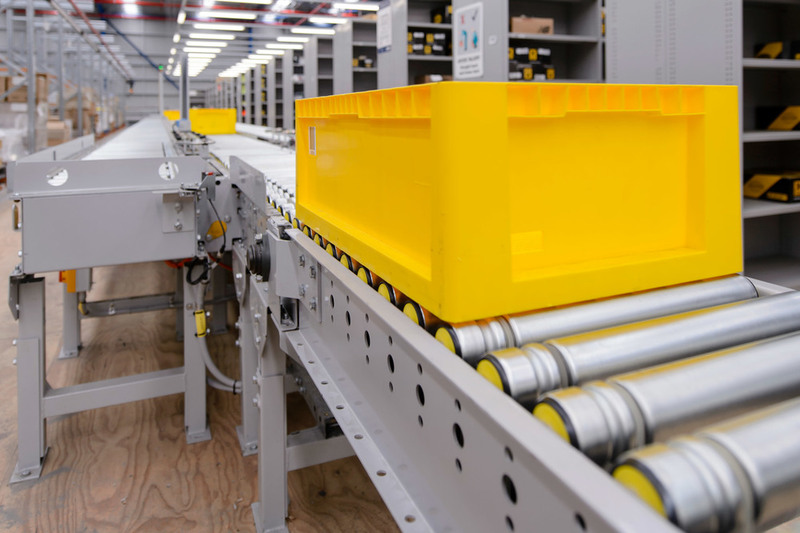 Automated pallet conveyors are a fast, accurate, and reliable method of transporting unit loads throughout a facility. Pallets can be transported on roller or chain conveyor, and loaded or unloaded by pallet trucks, forklifts, AGVs, pallet shuttle carts, overhead monorails, or ASRS machines. From planning and design, right through maintenance and inspections, Colby can provide the services you need to maximise your investment.